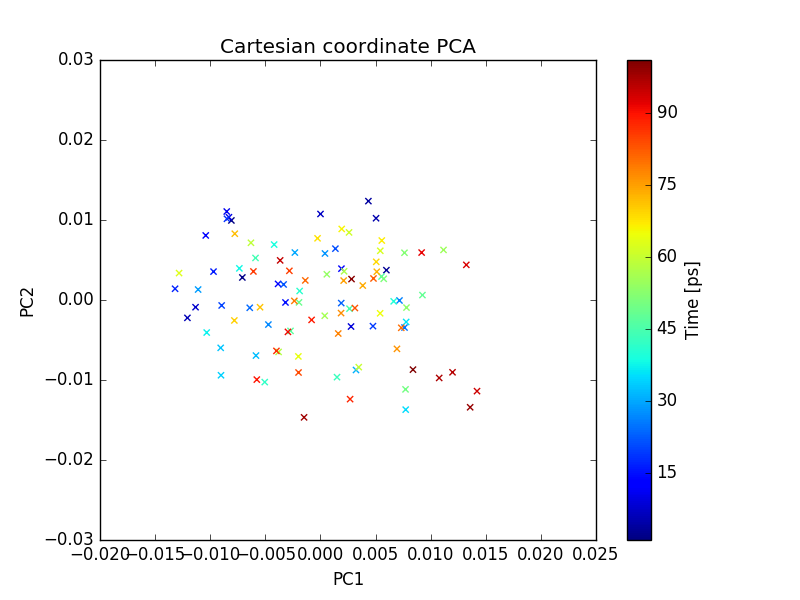 In this tutorial, we will be performing PCA on a MD trajectory of protein. Before doing the PCA, we need to prepare the trajectory which includes removing periodicity and removing water molecules. Most of the MD packages have options to do this. We will be using GROMACS in this tutorial. We will be using .xtc format for trajectory and .pdb for topology file. Any other common trajectory format should also work with MODE-TASK. select system to apply it. Copy the entire contents of the MODE-TASK scripts into the MODE-TASK directory. We will run all scripts from the MODE-TASK directory. Move the trajectory (md_01_noWAT.xtc) and topology file (complex.pdb) into the Tutorial directory. MODE-TASK includes tools to perform PCA on Cartesian coordinates as well as internal coordinates. 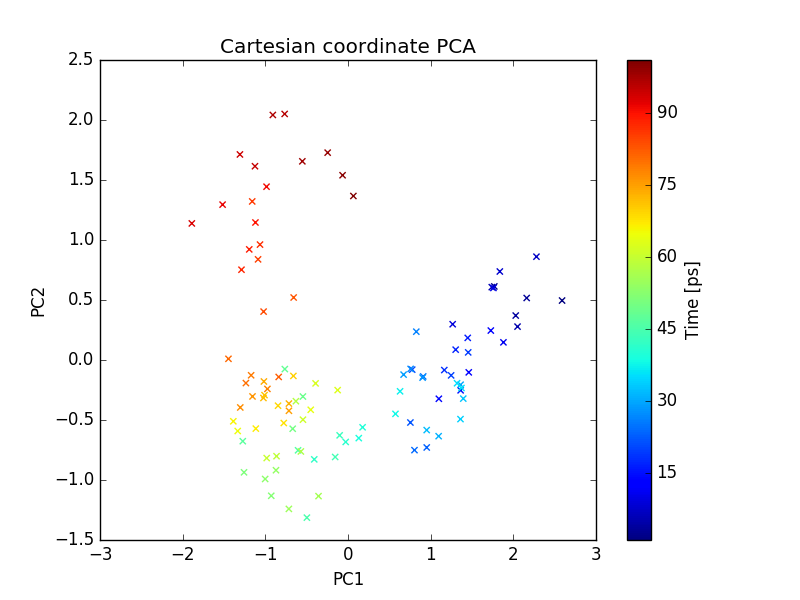 It also allows users to run different variants of PCA on a single MD trajectory. Run the following command to perform the singular value decomposition (SVD) PCA on CA atoms. (a)- Various output files are written to the out_md_01_noWAT.xtc directory. 2D Plot of first 3 PCs, Scree plot, RMSD plot, and RMSD Modes plot. For details about these output files, please refer to the MODE-TASK documentation. (b)- Command line output: Following output is redirected to command line. 2D Plot of the first 3 PCs in grace and png format is written. In order to open the .agr file with xmgrace run the following command. You can also visualize the .png format figure plot by opening it with your favorite picture visualizer. 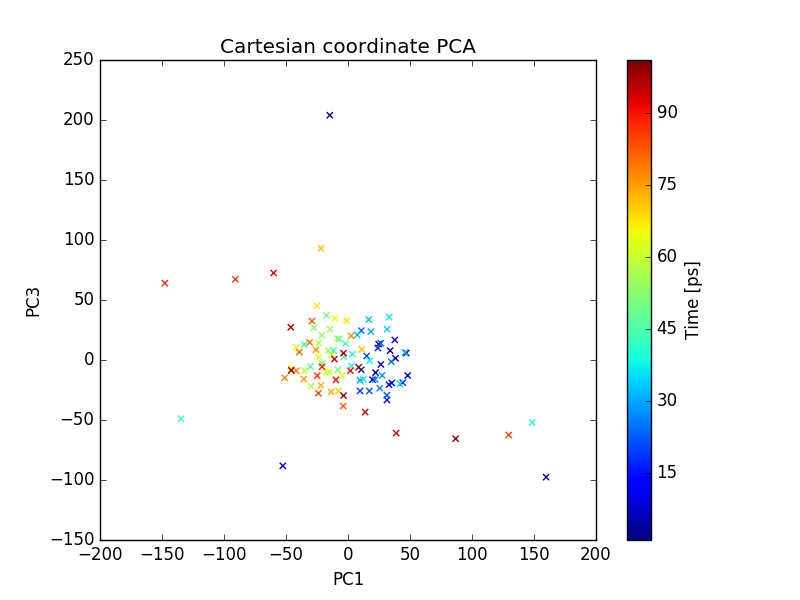 In the same way, open the rmsd.agr and pca_variance.agr. 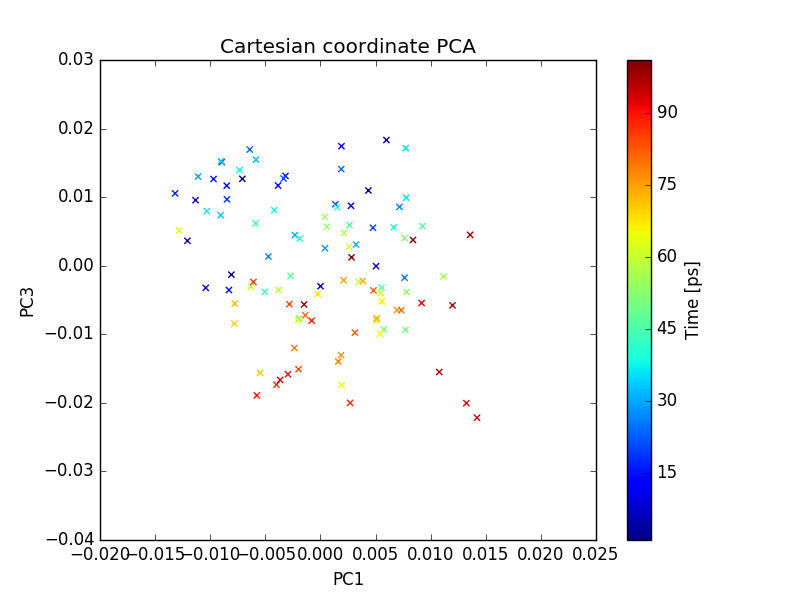 One can also do PCA on internal coordinates of a MD trajectory. Options are available for different types of internal coordinates such as, pairwise distance between atoms, 1-3 angle between backbone atoms, phi angle, and psi angle. 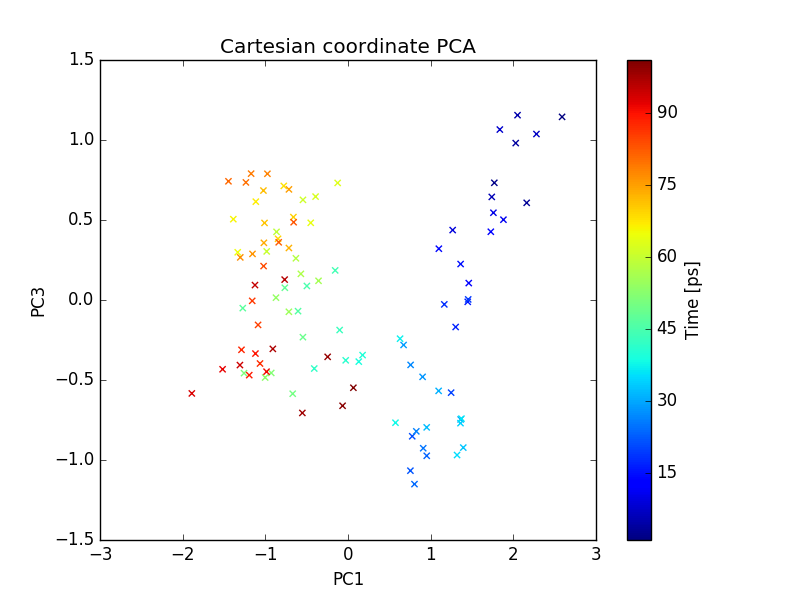 Run the following command to do PCA on pairwise distance between CA atoms. Run the following command to do PCA on backbone psi angles. Output files include 2D plot of first 3 PCs and Scree plot, which can be visualized using xmgrace as described earlier. To perform the MDS on pairwise RMSD between C-alpha atoms, run the following command. 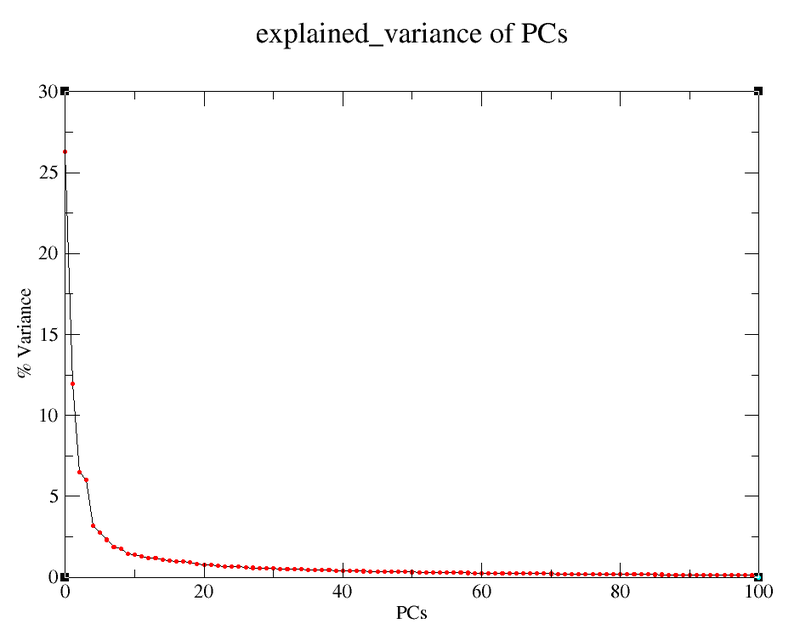 Output files include 2D plot of first three PCs which can be visualized using xmgrace as described earlier. 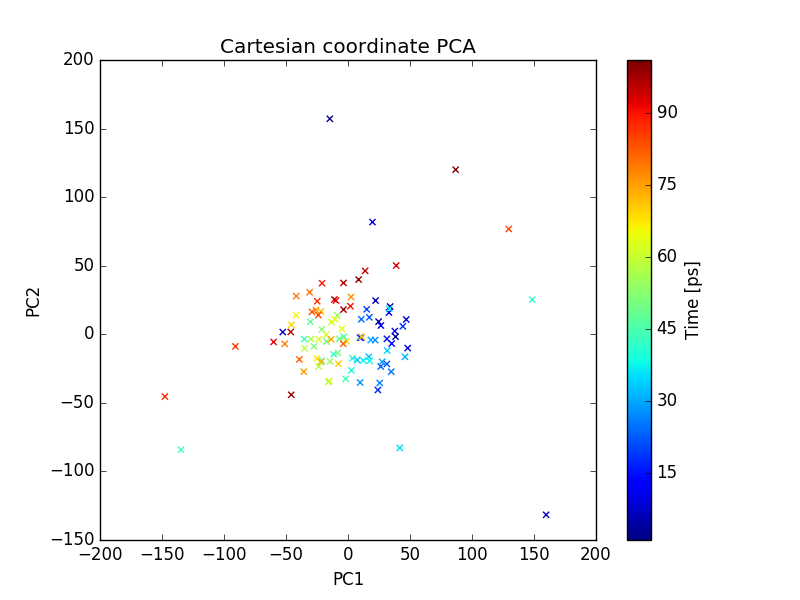 Run the following command to perform t-SNE using pairwise RMSD of CA atoms as the index of dissimilarity. Output files include 2D plot of the first 3 PCs, which can be visualize using xmgrace as described earlier. © Copyright 2017, CJ Ross, B Nizami, M Glenister, OS Amamuddy, AR Atilgan, C Atilgan and Ö Tastan Bishop Revision 13d6ff55.